TORONTO (Reuters) - The loonie posted its biggest gain against the U.S. dollar in nearly four months on Wednesday, buoyed by optimism about a NAFTA trade deal and higher oil prices, while the greenback broadly fell even as the Federal Reserve hiked interest rates. The U.S. dollar <.DXY> extended its decline against a basket of major currencies after Fed policy-makers signaled they expected three interest rate increases for 2018, fewer than the four some traders had anticipated. "The Canadian dollar is strengthening in tandem with all the G10 currencies in a weak U.S. dollar environment," said Eric Theoret, currency strategist at Scotiabank. Prime Minister Justin Trudeau said he remained optimistic Canada would get a good deal at North American Free Trade Agreement modernization talks amid signs negotiators could be closer to settling one of the trade pact's most contentious issues. 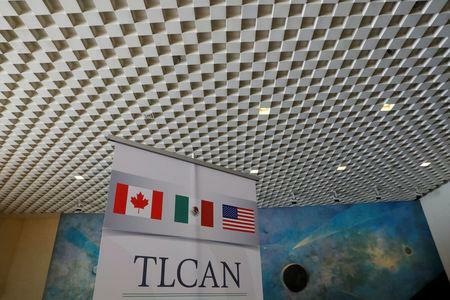 Toronto's Globe and Mail newspaper said the U.S. side had dropped its insistence that all autos made in NAFTA nations should have 50 percent U.S. content. "It does remove some source of uncertainty," said Alvise Marino, FX strategist at Credit Suisse in New York. "It's still too early for the BoC to meaningfully change its view on this front." The Bank of Canada has been worrying that uncertainty over the future of NAFTA may weigh on the economy. U.S. crude oil futures settled 2.6 percent higher at $65.17 a barrel after a surprise decline in U.S. inventories and as concern persisted over possible disruption to Middle East supply. At 4 p.m. EST (2100 GMT), the Canadian dollar was trading at C$1.2901 to the greenback, or 77.51 U.S. cents, up 1.3 percent in its largest advance since Dec. 1. The currency touched its strongest level since March 13 at C$1.2890. Canadian government bond prices were lower across the yield curve, with the two-year down 7.5 Canadian cents to yield 1.867 percent and the 10-year falling 33 Canadian cents to yield 2.255 percent. The 2-year yield touched its highest intraday since June 2011 at 1.909 percent.